Whipped cream is that little something that makes our desserts and drinks taste better. If you like it then celebrate National Whipped Cream Day on January 5. The date for celebration of National Whipped Cream Day falls on the birthday of Aaron Lapin, the inventor of whipped cream in aerosol can (Reddi-Wip). The first whipped cream in cans was sold in 1948 in St. Louis by milkmen and since then gained special popularity among housewives. 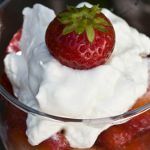 First whipped cream recipes relate to the 16th century when it was called “milk snow” or “snow cream”. According to those recipes, naturally separated cream was whipped with willow or rush branches and then skimmed off and drained to separate the foam. The process was very hard and took hours to prepare whipped cream. No matter what kind of whipped cream you like (from aerosol can or whisked by hand) it is one of those little delights that deserve our recognition. National Whipped Cream Day provides a perfect excuse to add a generous portion of whipped cream on top of your sweet treat.